Before moving on to consider boundary conditions, it is appropriate to examine node and element ordering and its effect on efficiency of solution by briefly exploring the methods used. The formation of the element characteristic matrices (to be considered in §9.7, 9.8 and 9.9), and the subsequent solution are the two most computationally intensive steps in any fe. analysis. The computational effort and memory requirements of the solution are affected by the method employed, and are considered below. For a given number of dof. 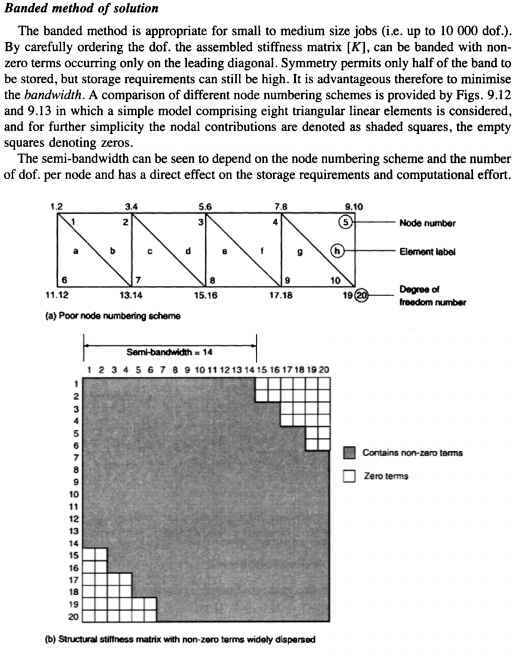 per node, which is generally fixed for each assemblage, the bandwidth can be minimised by using a proper node numbering scheme. With reference to Figs. 9.12 and 9.13 there are a total of 20 dof. in the model (i.e. 10 nodes each with an assumed 2 dof. ), and if the symmetry and handedness is not taken advantage of, storage of the entire matrix would require 202 = 400 locations. For the efficiently numbered model with a semi-bandwidth of 8, see Fig. 9.13, taking advantage of the symmetry and handedness, the storage required for the upper, or lower, half-band is only 8 x 20 = 160 locations. Fig. 9.13. Structural stiffness matrix corresponding to efficient node ordering. where / is the number of dof. per node and d is the maximum largest difference in the node numbers for all elements in the assemblage. This expression is applicable to any type of finite element. 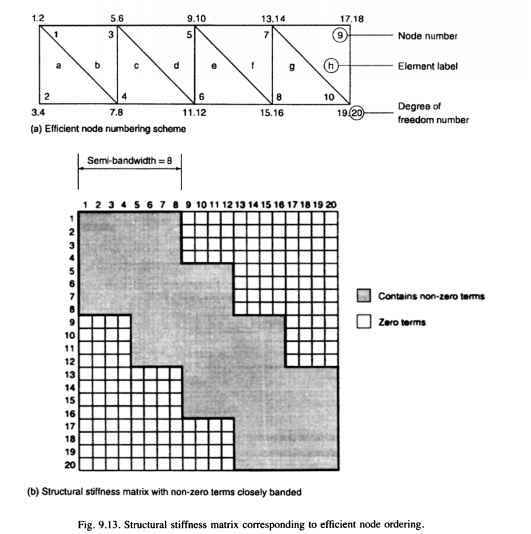 It follows that to minimise the bandwidth, d must be minimised and this is achieved by simply numbering the nodes across the shortest dimension of the region. For large jobs the capacity of computer memory can be exceeded using the above banded method, in which case a frontal solution is used. The frontal method is appropriate for medium to large size jobs (i.e. greater than 10000 dof.). To illustrate the method, consider the simple two-dimensional mesh shown in Fig. 9.14. Nodal contributions are assembled in element order. 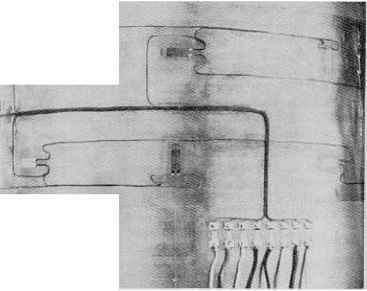 With reference to Fig. 9.14, with the assembly of element number 1 terms (i.e. contributions from nodes 1, 2, 6 and 7), all information relating to node number 1 will be complete since this node is not common to any other element. Thus the dofs. for node 1 can be eliminated from the set of system equations. Element number 2 contributions are assembled next, and the system matrix will now contain contributions from nodes 2, 3, 6, 7 and 8. At this stage the dofs. for node number 2 can be eliminated. Further element contributions are merged and at each stage any nodes which do not appear in later elements are reduced out. The solution thus proceeds as a front through the system. As, for example, element number 14 is assembled, dofs. for the nodes indicated by line B are required, see Fig. 9.14. After eliminations which follow assembly of element number 14, dofs. associated with line C are needed. The solution front has thus moved from line A to C.